The messaging application is quite straightforward. It has a new message button and bellow it are all the received messages organized in threads. The same swiping functionality found in the phonebook has been integrated here as well. A swipe to the left starts a new message, while swiping to the right will start a call. The application-specific search lets you quickly find a given message among all your stored SMS and MMS. Tap and hold on a message and a context menu brings up options such as edit, forward, delete and lock as well as view details and copy message text. A press-and-hold in the tap-to-compose area gives you access to functions such as cut, copy and paste. Once a text is copied you can paste it across applications like email, notes, chats, etc. Adding multimedia content to a text message automatically turns into an MMS. You can just quickly add a photo or an audio file to go with the text or – depending on your needs – you can choose to go into a full-blown MMS editor. Handling email can be done either with the standard Gmail app or the generic email app. The Gmail one supports batch operations, which allows multiple emails to be archived, labeled or deleted. Multiple Gmail accounts are supported too. The Gmail app found on the Galaxy Y is on par with the one on the Galaxy S II but with such a small screen estate you won't be able to go along as fast through texts. The generic email application is used for all your other non-gmail email accounts and supports multiple POP or IMAP inboxes. You have access to the original folders that are created online, along with the standard local ones such as inbox, drafts and sent items. The TouchWiz UI in the Galaxy Y features a combined inbox, which brings together all your mail in a single folder so you don’t need to check each one for new mail. This can be quite handy if you have lots of accounts and you just want to check if there is a new message needing your attention. The Samsung Galaxy Y comes with the Samsung home-baked keyboard preinstalled. Despite the smaller screen resolution, this keyboard feels comfortable to type on, what really makes it hard is the low screen size. Samsung has generously included Swype for an alternative input method. It is a life-saver on the smaller screens (such as the one of the Y) – you don’t have to be very accurate with your swyping, which makes text input faster and easier. It’s only that, much like with any other text prediction method, it has to support the language you want to enter text in. 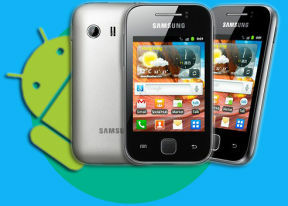 The Samsung Galaxy Y comes with the stock Android gallery. It offers the good ol’ functionality, cool 3D looks and nice transition effects, but unfortunately (again) only shows a downsized version of your images - this, however, isn't that insufferable on the Galaxy Y as those 2 MP shots don't really need more pixels. Images and videos placed in different folders appear in different sub-galleries that automatically get the name of the folder, which is very convenient – just like a file manager. The different albums appear as piles of photos which fall in neat grids once selected. Online albums at Picasa show up as separate stacks as well. Thanks to multi-touch support pinch zooming is also enabled on the Galaxy Y but you can also double tap or use the +/- buttons. The video player found on the Galaxy Y is plain and simple to use but due to the hardware limitations will not play any DivX or XviD videos, the same goes for over WVGA resolution videos. Anyway this is a simple case of what you get is what you've paid for - the price justifies the limits. The video player can handle 3GP and MP4 video files. You can use the Gallery or the My Files app to browse videos. The on-screen controls boil down to play/pause and skip buttons as well as a scrollable progress bar. The music player in the Samsung Galaxy Y is equipped with the TouchWiz UI as well. You can sort the music using the sorting options which are neatly displayed in a tabbed interface. Among the options are current playlist, all tracks, playlists and albums, artists and composers. You are free to remove some of the filters to make the interface easier to navigate. The Now playing screen offers an artist cover background and plenty of options. While on a track you can also browse the songs in the same album. Music experience on the Galaxy Y can be enhanced thanks to the included equalizer in the settings menu. The Samsung Galaxy Y S5360 did fairly well in our audio quality test. It's not the best we have seen, but it certainly does better than its price tag suggests. When connected to an external amplifier the smartphone got some really impressive scores with the only average stereo crosstalk being the only exception. 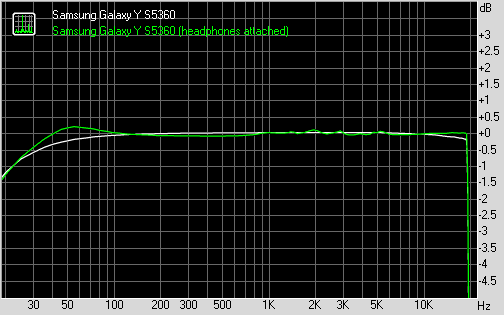 Luckily the hit that the performance takes when headphones are connected is not too bad - stereo crosstalk spikes and some intermodulation distortion creeps in, but that's about it. Sadly, the volume level in either scenario is quite low.